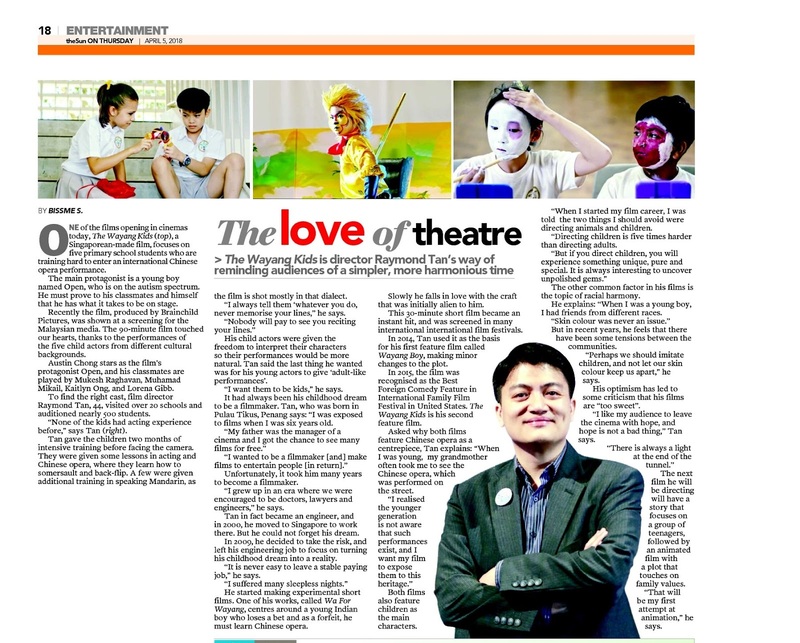 ONE OF the films opening in cinemas today, The Wayang Kids focuses on five primary school students who are training hard to enter an international Chinese opera performance. The main protagonist is a young boy named Open, who is on the autism spectrum. He must prove to his classmates and himself that he has what it takes to be on stage. Recently the film under produced by Brainchild Pictures was showed at a screening for the Malaysian media. The 90-minute film touched our hearts, thanks to the performances of the five child actors from different cultural backgrounds. Austin Chong stars as the film’s protagonist Open, and his classmates are played by Mukesh Raghavan, Muhamad Mikail, Kaitlyn Ong, and Lorena Gibb. 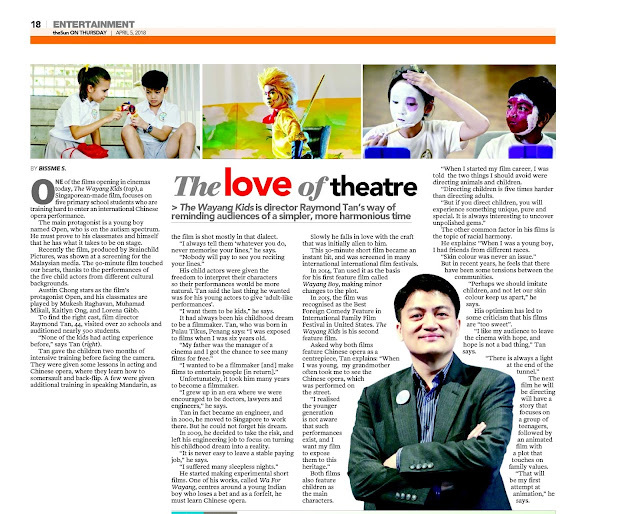 To find the right cast, film director Raymond Tan, 44, visited over 20 schools and auditioned nearly 500 students. “None of the kids had acting experiences before,” says Tan. Tan gave the children two months of intensive training before facing the camera. They were given some lessons in acting and Chinese opera, where they learn how to somersault and back-flip. A few were given additional training to brush up their Mandarin, as the film is mostly in that dialect. “I always tell them ‘whatever you do, never memorise your lines,” he says. His child actors were given the freedom to interpret their characters so their performance would be more natural. Tan said the last thing he wanted was for his young actors to give ‘adult-like performances’. “I want them to be kids,” he says. It had always been his childhood dream to be a film maker. Tan, who was born in Pulau Tikus, Penang says: “I was exposed to films when I was six years old. “I wanted to be a filmmaker [and] make films to entertain people [in return]." Unfortunately, it took him many years to become a filmmaker. “I grew up in an era where we encourage to be doctors, lawyers and engineers,” he says. Tan in fact became an engineer, and in 2000, he moved to Singapore to work there. But he could not forget his dream. In 2009, he decided to take the risk, and left his engineering job to focus on turning his childhood dream into a reality. “It is never easy to leave stable paying job,” he says. He started making experimental short films. One of his works, called Wa For Wayang, centres around a young Indian boy who loses a bet and as a forfeit, must learn Chinese Opera. Slowly he falls in love with the craft that was initially alien to him. This 30-minute short film became an instant hit and showed in many international international film festivals. In 2014, used it as the basis for his first feature film called Wayang Boy, making minor changes to the plot. In 2015, the film was recognised as the Best Foreign Comedy Feature in International Family Film Festival in United States. The Wayang Kids is his second feature film. Asked why both films feature Chinese Opera as a centrepiece, Tan explains: “When I was young, my grandmother often to took me see the Chinese opera that was performed on the street. Both films also feature children as the main characters. “When I started my film career, I was told the two things I should avoid were directing animals and children. “Directing children is five time harder than directing adults,” he says. The other common factor in his films is the topic of racial harmony. He explains: “When I was a young boy, my friends from different races. But in recent years, he feels that there have been tensions between the communities. “Perhaps we should imitate children, and not let our skin colours keep us apart,” he says. His optimism has led to some criticism that his films are “too sweet”. “I like my audience to leave the cinema with hope, and hope is not bad thing,” Tan says. The next film he will be directing will have a story that focuses on a group of teenagers, followed by an animated film with a plot that touches on family values. “That will be my first attempt at animation,” he says.